Congress was rightly concerned that the costs for these legal actions was going to drive most, if not all, manufacturers from the USA market. That would have been a horrific problem for the country, with no ability to protect children from deadly and dangerous diseases. The NVICP provides a no-fault program to resolve vaccine injury claims – “quickly, easily, with certainty and generosity.” The program was (and continues to be) funded by a tax on all vaccines sold in the country. Moreover, using a system of expert administrative “judges” (called Special Masters), a petitioner seeking to establish causation-in-fact must show, by a preponderance of the evidence, that but for the vaccination they would not have been injured, and that the vaccination was a substantial factor in bringing about their injury. The NVICP works reasonably well to compensate any real victims of vaccine injury, though, like any system, it is not perfect. For example, a panel of three special masters began hearing the first cases of the historic Omnibus Autism Proceedings in June 2007. They decided that there was absolutely no evidence, confirmed by peer-reviewed clinical research, that there was a link between vaccines and autism spectrum disorders. furthermore, most of these claims (1562) were settled – and settlements do not require showing causation, and do not mean the claim has merit. As the HRSA explains: What reasons might a claim result in a negotiated settlement? – Prior to a decision by the U.S. Court of Federal Claims, both parties decide to minimize risk of loss through settlement. Since 1988, approximately US$3.2 billion have been paid to 4,205 claims that were determined to be related to vaccines. Yes, it seems like a large number, but again, based on the billions of doses of vaccines delivered, the number of cases is extremely small. The amount isn’t as large as it seems either since one debilitating injury can cost millions, and since it includes about $150 millions in lawyer fees, including for losing claims. We’ve complained about how some antivaccination groups are really awful at simple math. These numbers for vaccine injury claims are so small that we ought to take pride in the medical miracle of vaccines. Moreover, the NVICP is a fairly efficient system in taking care of those who are actually injured by vaccines. Furthermore, researchers watch over the claims, since they really work to show causality, to determine how to make next generation vaccines better and safer. There are two ways a petitioner can show causation in NVICP. One way is to prove that your case is covered by the “table” that establishes what injuries have some relationship to a vaccine. The other is to prove an off-table injury by showing that more likely than not the vaccine caused the injury. Even there, however, petitioners get a break. Petitioners don’t need to show that science supports a causal connection between the vaccine and the problem. If they provide an expert that suggests a plausible theory, that can be enough – though the other side may counter it with their own experts. It’s a good system, maybe even a great one. It makes it relatively easy for the injured to get generous compensation, without forcing them to go through a difficult set of procedures to win a tort case. And it doesn’t allow for spurious claims based on bad science, anecdotes and nonsense. That’s also good. Although the injuries were caused by the flu vaccination, they were not caused by the vaccine itself. Here’s what happens. A flu vaccine must be delivered intramuscularly, that is, directly into the muscle. Generally, a healthcare worker will pinch the muscle on the upper arm (the deltoid muscle) in an attempt to deliver the vaccine into the muscle. The upper arm tends to have less subcutaneous fat, so it is considered the best location for flu vaccines. Most package inserts for flu vaccines recommend 1″ needles (although medicine is nearly 100% metric, for some obscure reason, needle length remains in inches for most of the world) for adults and ½” needles for children, so that the injection actually gets into the deltoid muscle. Unfortunately, there are a lot of nerves, blood vessels, ligaments and other important physiological structures in this area. 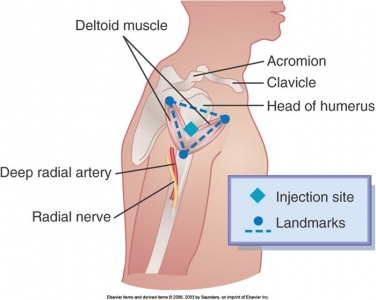 And if the injection is done improperly there can be painful and sometimes permanent damage to this area of the deltoid muscle. This muscle is incredibly important for the large range of motion of the arms around the shoulder. When it is in pain, usually even if it is in just one small part of the range of motion, it can be debilitating. Up until a few years ago, the NVICP only compensated for vaccine injury claims that involved the actual contents of the vaccine. Now they will compensate patients that have been diagnosed with shoulder injury related to vaccine administration (SIRVA). Now just to be clear, SIRVA could happen with any intramuscular injection (vaccine or otherwise) that uses a longer needle into the deltoid muscle. Diabetics, for example, use shorter needles and are taught to inject insulin into fatty areas of the arm, thigh and abdomen. But if a diabetic used the wrong size needle and went too high on the arm, they could cause a SIRVA-like issue. SIRVA generally is caused by a vaccine injected improperly high on the arm. This can damage musculoskeletal structures of the shoulder, such as tendons, ligaments or bursa, causing sudden shoulder pain. There is simply no relationship to the contents of flu, or any other, vaccine. An intramuscular vaccination in the arm should avoid the top third of the deltoid muscle and aim for the middle of the muscle, its thickest portion. Both the patient and the provider should be on the same plane — that is, either both sitting or both standing, although sitting is preferred. This reduces the risk of inadvertently injecting the vaccine too high up into the shoulder. (When I received the injection that led to problems, I was sitting down and the nurse was standing up). It is also a good idea to hold the arm out a little from the side, a position that helps protect the bursa. The injection should go into the muscle at a 90-degree angle to the skin. The Centers for Disease Control and Prevention provides specific recommendations for needle size based on the patient’s weight, but generally “the needles get bigger as the patient gets bigger,’’ says JoEllen Wolicki, a nurse educator in CDC’s immunization services division. For patients and practitioners, the CDC’s web site has illustrations and recommendations describing proper vaccine protocols. As already mentioned, NVICP has already been compensated claims of SIRVA. What has changed – and the reason for the article – is that the Department of Health and Human Services (DHHS) included a proposal to add SIRVA to the Table of Injuries as part of a proposed rule. Two issues need clarifying: what does adding SIRVA to the Table mean, and what is a proposed rule. The DHHS proposes adding SIRVA developing within 48 hours of injection as an injury to all vaccines injected into the muscle. It also proposes adding the injury to MMR, Varicella and MMRV even though those vaccines are not currently injected into the muscle to avoid having to change the table if vaccines that need to be injected into the muscle are developed. A petitioner would not be compensated from injuries from these vaccines with the current version that is not injected into the muscle. What is a proposed rule? Under our Administrative Procedures Act, to pass a binding rule an agency has to publish a notice about the rule in the Federal Register, provide an opportunity for comment, and then publish a statement about the rule. Our courts have demanded that agencies provide good reasons for the rules. Today, agencies most commonly publish the rule on Regulations.gov, an electronic portal where people can find rules and post comments. DHHS has published a rule including various changes to the Table of Injuries on the site–there is now a comment period, when anyone can submit comments. These can be submitted until January 25, 2016 – a lengthy and generous period. Then the agency will consider the comments and issue a final rule, with explanation of its decisions. This is a chance for those with opinions on the table to provide input and affect its contents. Until the rule is finalized, SIRVA is not part of the Table – though petitioners can still win cases as off-table injuries. What adding the injury to the table means is that for people who develop SIRVA within 48 hours of vaccinating, there will be a presumption that the vaccination caused the harm. That should make getting compensation for these vaccine injury claims easier and quicker. Editor’s note: This article was originally published in August 2015 by myself and Dorit Rubinstein Reiss. It has been revised and updated to include more comprehensive information, to improve readability, and fix broken links.